Theodore Sturgeon (/ˈstɜːrdʒən/; born Edward Hamilton Waldo, February 26, 1918 – May 8, 1985) was an American writer, primarily of fantasy, science fiction and horror. He was also a critic. He wrote approximately 400 reviews and more than 200 stories. 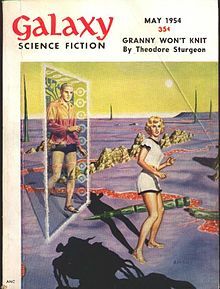 Sturgeon's science fiction novel More Than Human (1953) won the 1954 International Fantasy Award (for SF and fantasy) as the year's best novel and the Science Fiction Writers of America ranked "Baby is Three" number five among the "Greatest Science Fiction Novellas of All Time" to 1964. Ranked by votes for all of their pre-1965 novellas, Sturgeon was second among authors, behind Robert Heinlein. The Science Fiction and Fantasy Hall of Fame inducted Sturgeon in 2000, its fifth class of two dead and two living writers. Sturgeon was born Edward Hamilton Waldo in Staten Island, New York in 1918. His name was legally changed to Theodore Sturgeon at age eleven after his mother's divorce and remarriage to William Dicky ("Argyll") Sturgeon. He sold his first story in 1938 to the McClure Syndicate, which bought much of his early work. His first genre story was "Ether Breather", published by John W. Campbell in the September 1939 issue of Astounding Science Fiction. At first he wrote mainly short stories, primarily for genre magazines such as Astounding and Unknown, but also for general-interest publications such as Argosy Magazine. 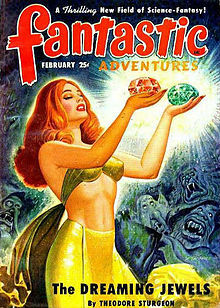 He used the pen name "E. Waldo Hunter" when two of his stories ran in the same issue of Astounding. A few of his early stories were signed "Theodore H. Sturgeon." Sturgeon ghost-wrote one Ellery Queen mystery novel, The Player on the Other Side (Random House, 1963). This novel gained critical praise from critic H. R. F. Keating: "[I] had almost finished writing Crime and Mystery: the 100 Best Books, in which I had included The Player on the Other Side ... placing the book squarely in the Queen canon" when he learned that it had been written by Sturgeon. Similarly, William DeAndrea, author and winner of Mystery Writers of America awards, selecting his ten favorite mystery novels for the magazine Armchair Detective, picked The Player on the Other Side as one of them. He said: "This book changed my life ... and made a raving mystery fan (and therefore ultimately a mystery writer) out of me. ... The book must be 'one of the most skilful pastiches in the history of literature. An amazing piece of work, whomever did it'." Disliking arguments with Campbell over editorial decisions, after 1950 Sturgeon only published one story in Astounding. Sturgeon wrote the screenplays for the Star Trek episodes "Shore Leave" (1966) and "Amok Time" (1967, written up and published as a Bantam Books "Star Trek Fotonovel" in 1978). The latter is known for its invention of pon farr, the Vulcan mating ritual; first use of the sentence "Live long and prosper"; and first use of the Vulcan hand symbol. Sturgeon is also sometimes credited as having deliberately put homosexual subtext in his work, like the back-rub scene in "Shore Leave", and the short story "The World Well Lost". Sturgeon also wrote several episodes of Star Trek that were never produced. One of these was notable for having first introduced the Prime Directive. He also wrote an episode of the Saturday morning show Land of the Lost, "The Pylon Express", in 1975. Two of Sturgeon's stories were adapted for The New Twilight Zone. One, "A Saucer of Loneliness", was broadcast in 1986 and was dedicated to his memory. Another short story, "Yesterday was Monday", was the inspiration for The New Twilight Zone episode "A Matter of Minutes". His 1944 novella "Killdozer!" was the inspiration for the 1970s made-for-TV movie, Marvel comic book, and alternative rock band of the same name. 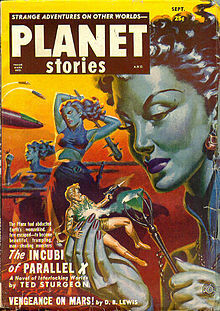 Sturgeon is well known among readers of classic science-fiction anthologies. At the height of his popularity in the 1950s he was the most anthologized English-language author alive. Describing "To Here and the Easel" as "a stunning portrait of personality disassociation as perceived from the inside", Carl Sagan said that many of Sturgeon's works were among the "rare few science‐fiction novels [that] combine a standard science‐fiction theme with a deep human sensitivity". John Clute wrote in The Encyclopedia of Science Fiction: "His influence upon writers like Harlan Ellison and Samuel R. Delany was seminal, and in his life and work he was a powerful and generally liberating influence in post-WWII US sf". He is not much known by the general public, however, and he won comparatively few awards. (One was the World Fantasy Award for Life Achievement from the 1985 World Fantasy Convention.) His best work was published before the establishment and consolidation of the leading genre awards, while his later production was scarcer and weaker. He was listed[according to whom?] as a primary influence on the much more famous Ray Bradbury. Sturgeon's original novels were all published between 1950 and 1961, and the bulk of his short story work dated from the 1940s and 1950s. Though he continued to write through 1983, his work rate dipped noticeably in the later years of his life; a 1971 story collection entitled Sturgeon Is Alive And Well addressed Sturgeon's seeming withdrawal from the public eye in a tongue-in-cheek manner. Sturgeon lived for several years in Springfield, Oregon. He died on May 8, 1985, of lung fibrosis, at Sacred Heart General Hospital in the neighboring city of Eugene. He was a member of the all-male literary banqueting club the Trap Door Spiders, which served as the basis of Isaac Asimov's fictional group of mystery solvers the Black Widowers. Sturgeon was the inspiration for the recurrent character of Kilgore Trout in the novels of Kurt Vonnegut. In 1951, Sturgeon coined what is now known as Sturgeon's Law: "Ninety percent of [science fiction] is crud, but then, ninety percent of everything is crud." This was originally known as Sturgeon's Revelation; Sturgeon has said that "Sturgeon's Law" was originally "Nothing is always absolutely so." However, the former statement is now widely referred to as Sturgeon's Law. He is also known for his dedication to a credo of critical thinking that challenged all normative assumptions: "Ask the next question." He represented this credo by the symbol of a Q with an arrow through it, an example of which he wore around his neck and used as part of his signature in the last 15 years of his life. This article's section called "Life and family" needs additional citations for verification. Please help improve this article by adding citations to reliable sources. Unsourced material may be challenged and removed. Sturgeon was a distant relative of Ralph Waldo Emerson, and through his Waldo, Hamilton Dicker and Dunn ancestors, a direct descendant of numerous influential Puritan, Presbyterian, and Anglican clergymen. Both Sturgeon and his brother Peter eventually became atheists, although Sturgeon continuously developed his own highly imaginative spiritual side. If Sturgeon was aware of much of his ancestry or stories associated with it, he never shared them with his friends or children, although the short "I Say—Ernest" (1972) does bring to life one wing of his ministerial family. Sturgeon's sibling, Peter Sturgeon, wrote technical material for the pharmaceutical industry and the WHO, and founded the American branch of Mensa. Peter and Theodore's birth father, Edward Waldo, was a color and dye manufacturer of middling success. With his second wife, Anne, he had one daughter, Joan. Peter and Theodore's mother, Christine Hamilton Dicker (Waldo) Sturgeon, was a well-educated writer, watercolorist, and poet who published journalism, poetry, and fiction under the name Felix Sturgeon. Their stepfather, William Dickie Sturgeon (sometimes known as Argyll), was a mathematics teacher at a prep school and then Romance Languages Professor at Drexel Institute [later Drexel Institute of Technology] in Philadelphia. Sturgeon held a wide variety of jobs during his lifetime. As an adolescent, he wanted to be a circus acrobat; an episode of rheumatic fever prevented him from pursuing this. From 1935 (aged 17) to 1938, he was a sailor in the merchant marine, and elements of that experience found their way into several stories. He sold refrigerators door to door. He managed a hotel in Jamaica around 1940–1941, worked in several construction and infrastructure jobs (driving a bulldozer in Puerto Rico, operating a gas station and truck lubrication center, work at a drydock) for the US Army in the early war years, and by 1944 was an advertising copywriter. In addition to freelance fiction and television writing, he also operated a literary agency (which was eventually transferred to Scott Meredith), worked for Fortune magazine and other Time Inc. properties on circulation, and edited various publications. Sturgeon had somewhat irregular output, frequently suffering from writer's block. Sturgeon played guitar and wrote music which he sometimes performed at Science Fiction Conventions. Sturgeon was married three times, had two long-term committed relationships outside of marriage, divorced once, and fathered a total of seven children. His first wife was Dorothe Fillingame (married 1940, divorced 1945) with whom he had two daughters, Patricia and Cynthia. He was married to singer Mary Mair from 1949 until an annulment in 1951. In 1953, he wed Marion McGahan with whom he had a son, Robin (b. 1952); daughters Tandy (b. 1954) and Noël (b. 1956); and son Timothy (b. 1960). The children in "Tandy's Story" (1961) have the same names as these children. In 1969, he began living with Wina Golden, a journalist, with whom he had a son, Andros. Finally, his last long-term committed relationship was with writer and educator Jayne Engelhart Tannehill, with whom he remained until the time of his death. Sturgeon was a lifelong pipe smoker. His death from lung fibrosis may have been caused by exposure to asbestos during his Merchant Marine years. Voyage to the Bottom of the Sea (1961) The book is described in Voyage to the Bottom of the Sea (novel). I, Libertine (1956): Historical novel created as a for-hire hoax. Credited to "Frederick R. Ewing", written from a premise by Jean Shepherd. The Player on The Other Side (1963): Mystery novel credited to Ellery Queen and ghost-written with Queen's assistance and supervision. Sturgeon published numerous short story collections during his lifetime, many drawing on his most prolific writing years of the 1940s and 1950s. Note that some reprints of these titles (especially paperback editions) may cut one or two stories from the line-up. Statistics herein refer to the original editions only. The following table includes sixteen volumes (one of them collecting western stories). These are considered "original" collections of Sturgeon material, in that they compiled previously uncollected stories. However, some volumes did contain a few reprinted stories: this list includes books that collected only previously uncollected material, as well as those volumes that collected mostly new material, but also contained up to three stories (representing no more than half the book) that were previously published in a Sturgeon collection. 1946 1955 selected from 11 in 1955's "A Way Home"
1955 1958 selected from 4 in 1959's "Aliens 4"
North Atlantic Books has released the chronologically assembled The Complete Short Stories of Theodore Sturgeon, edited by Paul Williams, since 1994. The series runs to 13 volumes, the last appearing in September 2010. Introductions are provided by Harlan Ellison, Samuel R. Delany, Kurt Vonnegut, Gene Wolfe, Connie Willis, Jonathan Lethem, and others. Extensive "Story Notes" are provided by Paul Williams and (in the last two volumes) Sturgeon's daughter Noël. Argyll: A Memoir, (pamphlet, Sturgeon Project, 1993) an autobiographical sketch about Sturgeon's relationship with his stepfather. Introduction by his editor Paul Williams. Illustrated by Donna Nassar. ^ a b "Sturgeon, Theodore" Archived 2012-10-16 at the Wayback Machine. The Locus Index of SF Awards: Index to Literary Nominees. Locus Publications. Retrieved 2013-03-26. ^ a b c Theodore Sturgeon at the Internet Speculative Fiction Database (ISFDB). Retrieved 2013-04-18. Select a title to see its linked publication history and general information. Select a particular edition (title) for more data at that level, such as a front cover image or linked contents. ^ "Science Fiction and Fantasy Hall of Fame". Mid American Science Fiction and Fantasy Conventions, Inc. Retrieved 2013-03-26. This was the official website of the hall of fame to 2004. ^ Williams, Paul (1976). "Theodore Sturgeon, Storyteller" Archived 2003-09-13 at the Wayback Machine. First published 1997, online. Retrieved 2013-03-26. Quote: "Sturgeon because that was the stepfather's name—he was a professor of modern languages at Drexel Institute in Philadelphia—and Theodore because Edward was the boy's father's name and the mother was still bitter and anyway young Edward had always been known as Teddy." Quote: "To this day, libraries all over the world list 'Theodore Sturgeon' as a pseudonym for 'E. H. Waldo', which is incorrect." ^ a b Keating, H. R. F. (1989). The Bedside Companion to Crime. New York: Mysterious Press. ^ Nimoy (1995), p. 67. ^ Engel, Joel (June 1, 1994). Gene Roddenberry: The Myth and the Man Behind Star Trek. Hyperion. p. 92. ISBN 0786860049. Theodore Sturgeon, the most anthologized writer in the English language but one who'd never written for television before Star Trek, received several long letters and memos from Roddenberry. ^ Meehan, Paul (November 1, 1998). Saucer Movies: A UFOlogical History of the Cinema. Scarecrow Press. p. 166. ISBN 0810835738. Veteran science fiction writer Theodore Sturgeon, reportedly the most anthologized science fiction writer of all time, wrote the teleplay adaptation of his own short story for the ABC-TV movie Killdozer (1974). ^ a b Portal, Ann (May 10, 1985). "Famed author, award-winner, dies in Eugene". The Register-Guard. Eugene, Oregon. Retrieved 2011-06-20. ^ "Interview with Vonnegut". Archived from the original on January 15, 1998. Retrieved 2013-04-04. CS1 maint: BOT: original-url status unknown (link) "I think it's funny when someone is named after a fish"
^ Sturgeon, Theodore (April 1961). "Tandy's Story". Galaxy Science Fiction. pp. 170–194. ^ Noël Sturgeon [daughter], "Story Notes Volume XII", Sturgeon (2009), pp. 289–92. ^ Sturgeon (1978), p. 12. Nimoy, Leonard (1995). I Am Spock. New York: Hyperion. ISBN 978-0-7868-6182-8. Sturgeon, Theodore (1978). Sturgeon is Alive and Well ... New York: Pocket Books. ISBN 0-671-81415-X. Sturgeon, Theodore (2009). Slow Sculpture: Volume XII: The Complete Stories of Theodore Sturgeon. Berkeley, CA. ISBN 978-1-55643-834-9. "Theodore Sturgeon biography". Science Fiction and Fantasy Hall of Fame. "If All Men Were Brothers, Would You Let One Marry Your Sister?" "The Man Who Lost the Sea"
"The Pod in the Barrier"
This page was last edited on 25 February 2019, at 18:58 (UTC).